When Ferrellgas completed its merger with Blue Rhino Corporation in 2004, the Overland Park, KS-based company reinforced its position as one of the country’s premier propane providers. Today, the company boasts approximately 1 million residential, industrial, commercial and agricultural customers in all 50 states, the District of Columbia and Puerto Rico. Hybrid unit gives Ferrellgas the opportunity to blend delivery operations. 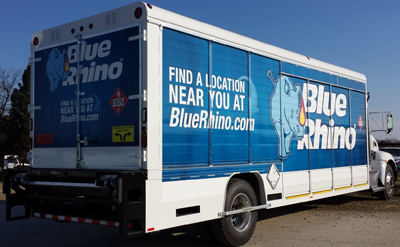 The addition of Blue Rhino, the nation’s largest provider of propane by portable tank exchange, was a perfect complement to Ferrellgas’ thriving industrial business. While Blue Rhino “grill bottles” keep homeowners fired up for their favorite barbecue foods, thousands of big and small businesses also count on Ferrellgas propane cylinders to keep their forklifts running. The synergy between the home and forklift exchange programs was significant enough for Ferrellgas to explore “blended” filling and delivery operations for the Blue Rhino grill bottles and the company’s 33 lb. forklift cylinders. Body has 4 full bays in front for the grill bottles, and 3 partial bays in the rear for 33 lb. cylinders. The idea came to fruition as a unique 14-bay “hybrid” body with 4 full bays in the front for the propane grill bottles, and 3 partial bays in the rear for the taller 33 lb. cylinders. There are no walls separating the back bays, but a center “spine” divides the “open” space in half. 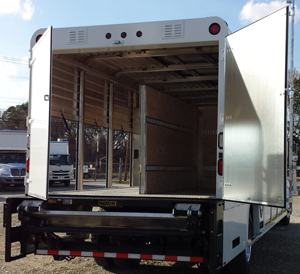 The space offers both rear and side access, and the truck features a tuck-away rear lift gate for dock deliveries. Prior to the hybrid, Ferrellgas had been using the standard beverage and forklift cylinder trucks for these applications. 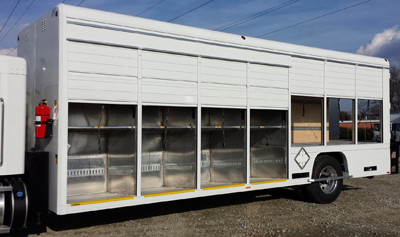 Open bays in rear section can be used for cages and racks to set up new customers. Abrams says the hybrid “is going to become the new standard model for grill bottle and blended deliveries. As with any new design, we want to tread slowly. After the prototype rolled out, we received very helpful feedback from the field in terms of design enhancements, and we worked with Mickey to incorporate those changes in the second unit,” which is now in the pipeline. Abrams should know. For 75 years, Ferrellgas has exhibited plenty of industry leadership and innovation of its own.